This is my Master Thesis from Umea Institute of Design. The project rethinks the in-flight food delivery process as a whole and suggest a new system. 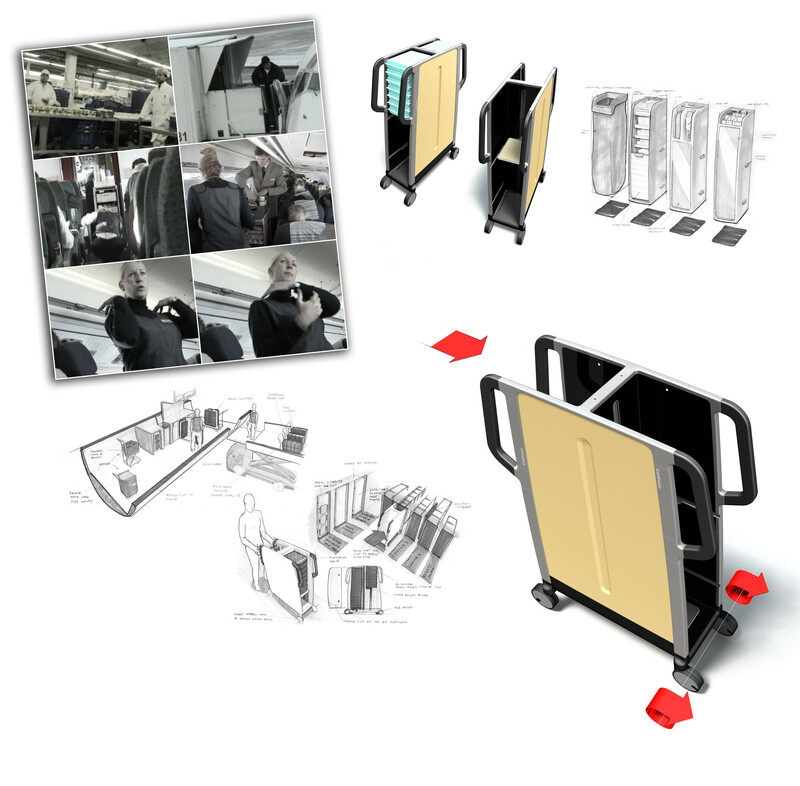 It is based on a cart that stay on the plane and significantly enhance the ergonomics for the flight attendants. The concept is based on a flexible cart that can be equipped to fit in every different serving situation. A closer look will reveal a substantial consideration for the cabin crew ergonomics as the motorized cart wheels relieve strenuous pulling and pushing. Moreover, a secondary motor raises the shelf where the food packages are stored eliminating the need to bend down while retrieving food. The possibility to choose between food serving and the different modules for serving drinks etc gives the system a big flexibility. Lastly, the project reinvestigates the in flight food delivery process as a whole suggesting neatly packaged food box modules to be brought directly onto the plane’s galley. Instead of having food carts at every hub, the carts are plane specific. This reduce the overall amount of food carts needed to maintain an operational effective system. It also cuts off the big expense of having the carts circulate the way they do in the current system. National Winner Nordics of the BraunPrize 2012. This is my Master Thesis from Umea Institute of Design. The project rethinks the in-flight food delivery process as a whole and suggest a new system. It is based on a cart that stay on the plane and significantly enhance the ergonomics for the flight attendants. The concept is based on a flexible cart that can be equipped to fit in every different serving situation. A closer look will reveal a substantial consideration for the cabin crew ergonomics as the motorized cart wheels relieve strenuous pulling and pushing. Moreover, a secondary motor raises the shelf where the food packages are stored eliminating the need to bend down while retrieving food. The possibility to choose between food serving and the different modules for serving drinks etc gives the system a big flexibility. Lastly, the project reinvestigates the in flight food delivery process as a whole suggesting neatly packaged food box modules to be brought directly onto the plane’s galley. Instead of having food carts at every hub, the carts are plane specific. This reduce the overall amount of food carts needed to maintain an operational effective system. It also cuts off the big expense of having the carts circulate the way they do in the current system. 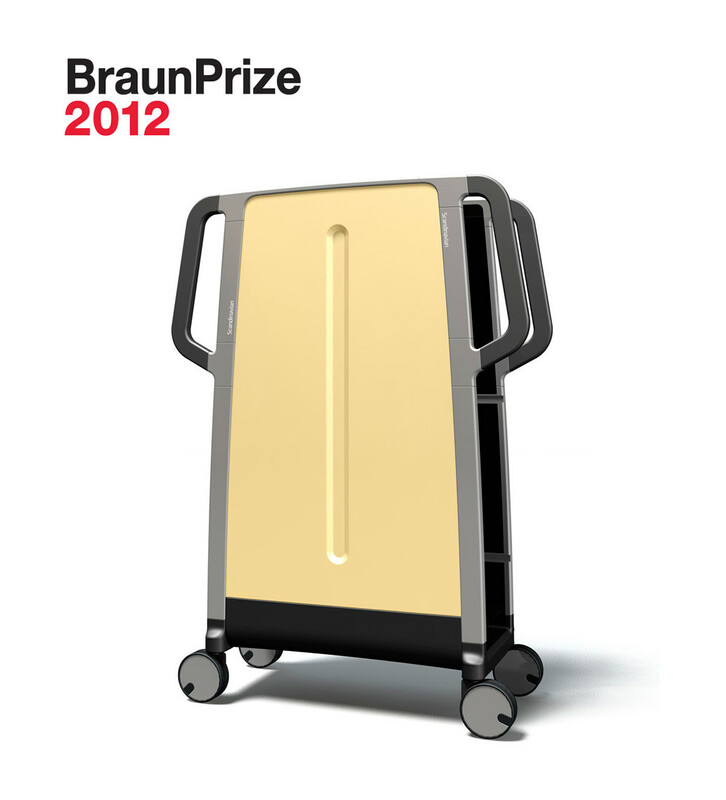 National Winner Nordics of the BraunPrize 2012.